This mod adds dynamic weather changes based on the seasons. Every time you sleep a script checks the month and adjusts the weather settings of the eight regions of Vvardenfell according to the season (so Sheogorad will snow in winter for example). REQUIRES EITHER OpenMW OR MCP TO FUNCTION. New Tamriel Rebuilt version added. This mod adds dynamic weather changes based on the seasons. Every time you sleep a script checks the month and adjusts the weather settings of the eight regions of Vvardenfell according to the season (so Sheogorad will snow in winter for example). REQUIRES EITHER OpenMW OR MCP TO FUNCTION. This requires either because the vanilla game has a bug in which month "0" (Morning Star, Nirn's January equivalent) gets skipped and thus throws off month-related stuff. The script requires you to sleep to run it. So your character will need to sleep in order to have it take effect. Most regions can experience snow in winter, while some (Sheogorad, Red Mountain, and Molag Amur) have a very, very small chance of snowing in Fall. Sheogorad and Red Mountain also have a chance to blizzard. Outside of that, the only thing else to mention is that the script has a check for whether or not you've completed the Main Quest, and will adjust RM's weather settings accordingly (this last function has not been tested yet). 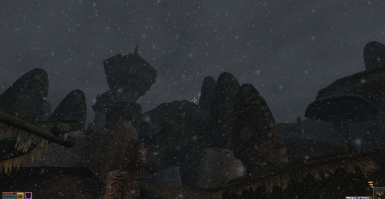 -You must be in either "Solstheim" or "Skaal Village" for the weather changes to occur on Solstheim (this is on purpose). -The fix to the journal part of the script is included in both files. -The Solstheim file HAS NOT been tested. The Vvardenfell stuff should all still work fine, but the Solstheim I'm not sure about, it *SHOULD* work, but Morrowind's CS is fickle and likes to be difficult. So there may be additional bugs with the additional content. -You MUST have Tamriel_Data loaded to play the "Seasonal Weather of Morrowind" file, this is the one that includes the Tamriel Rebuilt regions. This shouldn't be a problem as Tamriel Rebuilt's files (SHotN's and P:C's too) require Tamriel_Data to be loaded and its bsas registered anyways. -This includes both the TR_Mainland regions (the "finished" areas) and the TR_Preview regions (the WIP stuff). This is primarily due to just me wanting to get them over with. -In my haste to get all of the regions down (there were a LOT of regions to do), I missed Shipal Shin and Alt Orethan. I'll put them in at a later date, but I really didn't want to add to the time to doing this. -You can play this file with Tamriel_Data and no Tamriel Rebuilt files just fine, but there's not much point in playing with a considerably larger global script running every time you sleep if you aren't going to have TR_Mainland or TR_Preview loaded. Likewise, you can play this file with only Tamriel_Data and TR_Mainland without TR_Preview, or (for some reason) TR_Preview without TR_Mainland.